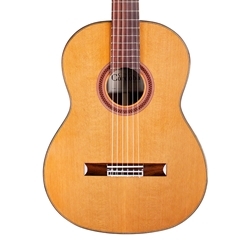 A step up from the C5, the C7 is a handcrafted traditional nylon-string acoustic, with a solid Canadian cedar or European spruce top, and Indian rosewood back and sides. It also has a traditional style hand-inlaid wooden rosette and a rosewood binding, bridge and fingerboard. A Cordoba gig bag is included.